Tribal Spirits unleashes their second EP and their third release upon mankind. Compared to their previous release they have switched some things around. Niels has left the band and his place was taken by Martijn Grooten, although Martijn went on to play guitars therefore Wesley de Peuter had to switch to bass. 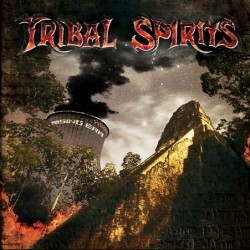 For me Tribal Spirits is an unknown band and this is their third self-released album. Tribal Spirits treats us on some uptempo thrash metal in the vein of old Sepultura and in line of the neo-thrash movement of the nineties. A genre that I count towards one of my favourite genres in the rock/metal sector and of course also a genre where it’s hard to keep your head above water. Rising Era is a decent release, which basically is because of a mediocre production and a lack of really interesting riffs. The lack of a good production is, I think, caused by a small budget and for a self-released album it’s not bad, but it’s not up to par with a lot of thrash metal releases we get to review. Of course these are signed bands, so it’s hard to hold this against Tribal Spirits. Nevertheless in ‘World Wide War’ for example the backing vocals are being shoved aside and almost not audible. Despite these negative things, there’s also enough to enjoy. For example the almost Slipknot like accelerations in ‘Desecrate Me’ combined with a Chimaira like vibe is quite an interesting song. The vocalist is also okay and powerful, although he could use more variation in his approach. Rising Era isn’t an album that blows me away, but in the light of this being a self-released effort it’s decent enough to peak my interest. If these guys could get signed by a label (which isn’t out of the realm of possibilities, since there are numerous bands signed that can’t even hold a candle to Tribal Spirits), I think that they could take some big steps forwards with a good production.